Well, I can see where the old boy is coming from. 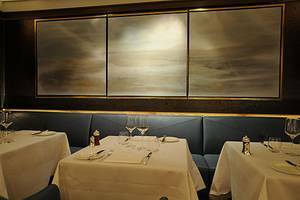 Here at Corrigan’s in Mayfair, the emphasis is on game, wild fish and seafood, shot through with the kind of rootsy Irish sensibility that is the hallmark of this chef’s brilliant cooking. There are dishes such as game broth with livers on toast; saddle of hare with roast pumpkin and sprout tops; roe venison in pastry with pickled cabbage; poached turbot on the bone, game terrine; plaice with almond crumb and mallard a l’orange with chicory – they all tell their own story of proper tradition married to shrewd skill and a deep understanding of what will work and what will not. This is evident in a simple, pitch perfect dish of salad of game birds with romesco sauce, just one offering on a dizzying list of over 20 starters. Although billed as a trio of game birds, four are actually served; long, thin ribbony slices of mallard, pheasant, grouse and partridge tossed into a mixed leaf salad dressed with a pungent romesco sauce with its wonderful rubble of hazelnuts and freshly chopped tomatoes. Tremendous! It is instantly one of our dishes of the year. ‘It’s one of the dishes of the century,’ says S as we chink glasses to the success of this exciting new venture. After a decade in London, first in rufty tufty Soho and then in posh Piccadilly, Richard Corrigan is on the move again. The celebrated Irish chef has just opened this plush, clubby new restaurant in Mayfair; a slice of the capital that discreetly throbs with wealth and style. Thank goodness, says yer man. Ten years on the front line of late night Soho was more than enough. In a recent interview, Corrigan revealed that the Lindsay House kitchen staff were often shouted at, the ceiling fell in, the place was a war zone front and back of house, and there was always someone going totally tonto on the premises. Only on the days when he was cooking there, of course. I jest! However, times have indeed changed. The lease is up and Lindsay House has been sold. Corrigan still has an interest in Bentley’s both in Dublin and in London, where the Piccadilly branch currently sells over 10,000 oysters per week. Added to this, he appears on television regularly and has several restaurant consultancies. But he appears to be relieved to have made his major base in the rarified climes of Upper Grosvenor Street, once noted as one of the finest thoroughfares in all Mayfair. ‘It’s great to be here after all that s***!’ he roars to his new customers this week. Oh dear. Who is going to break it to him that 30 anarchist squatters have just moved in a few doors down? Other Corrigan’s dishes we try include carpaccio of octopus; a good, juicy, chunk splashed with a Clementine reduction with some crunch provided by roasted almonds. Cornish crab jelly with melba toast is a fluffy mound of fresh crabmeat chopped through with avocado surrounded by an intense wibble of crab jelly; clever and delicious. A simple plate of wild smoked salmon from the Sally Barnes Woodcock Smokery at Skibbereen in West Cork, is so astoundingly good I ring her up the next day to order a whole side for Christmas. (I’ll serve it the way they do here: thickly sliced, with Irish soda bread and lemons on the side, and just burst with festive joy). Who ate all the pie? Us! Our main courses are also stupendous. First, a lovely piece of poached turbot on the bone with horseradish butter, steamed potatoes and carrots. A tasty and healthy triumph, it shows that this is a kitchen that can do game suet pudding but triumph at lighter dishes too. Light is not a description you could apply to the grouse pie, but sometimes, you know, you’ve just got to eat on the wild side. Corrigan’s take on this is a Wellington-style pie layered with grouse meat and decadently thick slices of foie gras; the most perfect autumn dish. It comes with a busy satellite patrol of little copper pots full of ceps, potatoes and spinach and if there is more fun to be had in London for £21, I have yet to find it. Puddings are quite busy; quince tart with swollen golden raisins and a soft Sauternes ice cream. The madeleines served with macerated figs and spiced ice cream are memorable, as they should be. As befits a restaurant selling a large amount of game, the décor has been inspired by a hunting lodge – perhaps the kind of hunting lodge you might find in Prussia, where Greta Garbo is serving trays of bullshots and the sound of axe chopping through bone drifts through from the kitchen now and again. Corrigan’s serious intent about this restaurant is everywhere; in the eponymous name above the door, to the quiet luxury and the warm welcome of the first class staff. 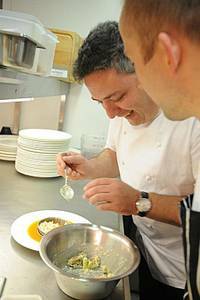 Together with his talented chef, Chris McGowan, something very special has been created here. Money has been spent on all the right things: the bar is lovely and even the lamps have feathers. There is a raft of eating areas from the bar and bar tables (my choice), to the glam dining room and two large private rooms. The wine list is thorough and well-chosen at all price levels, with a good selection by the glass and carafe. From the area of Cote Chalonnaise – a region that always provides good value for money - we choose a bottle of Rully Premier Cru Meix-Callet, a full, rich dry white with a bit of finesse. At £49.50 it is not a bad restaurant price for something of this quality. From the octopus to the grouse and beyond, it did us proud. What can I say? London has ached for a big, splendid restaurant like this for years. It is the kind of place Scott’s should be, but never dared to be. Fantastic, in a word. 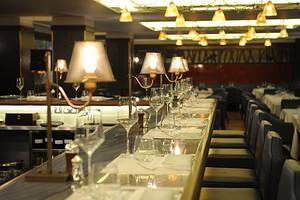 Corrigan’s Mayfair , 28 Upper Grosvenor Street , London W1K 7EH . Tel: 020 7499 9943. Lunch or dinner for two, excluding drinks and service, £70.